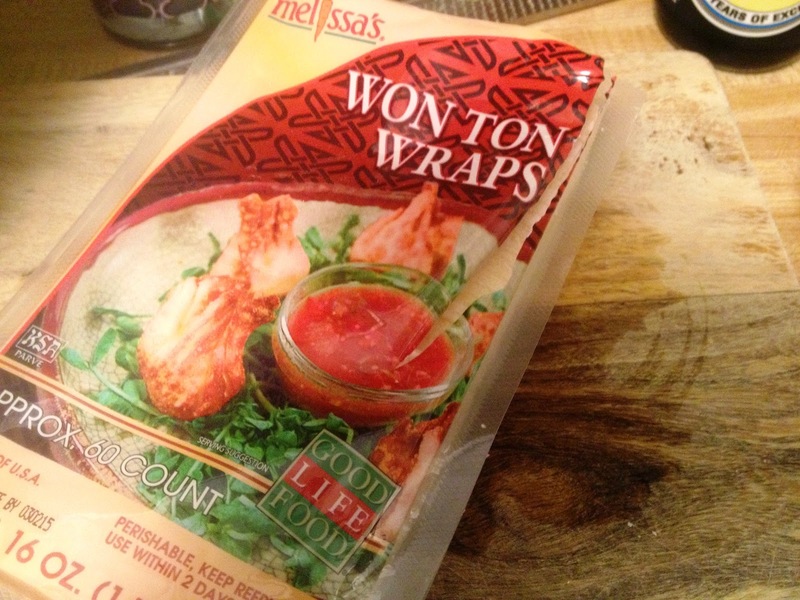 I started making wontons back in high school. My mom had come across a recipe for "Tex-Mex Wontons" and we made them for pretty much every party we hosted. In essence, it was taco meat folded into a wonton skin and fried. They were awesome. 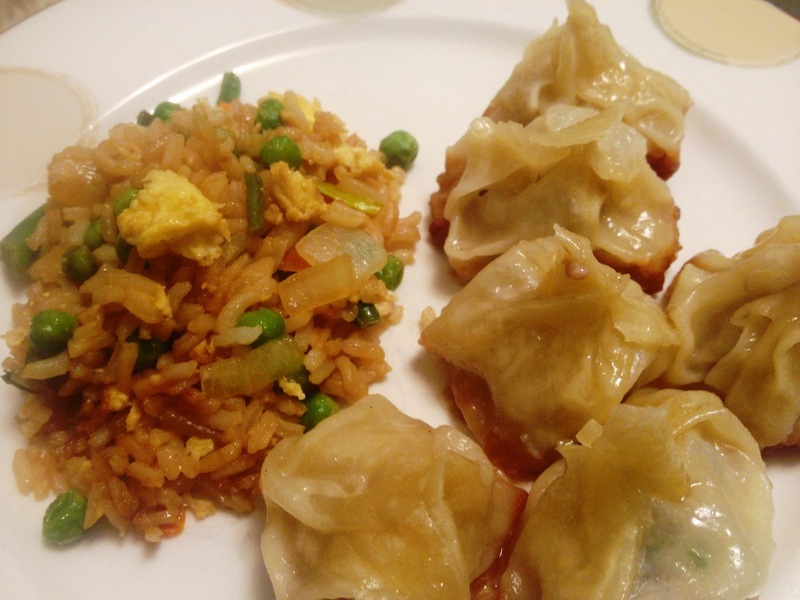 After college, my friend Susannah showed me how she makes her famous dumplings. You may call them potstickers. Do you know the reason they call them that? 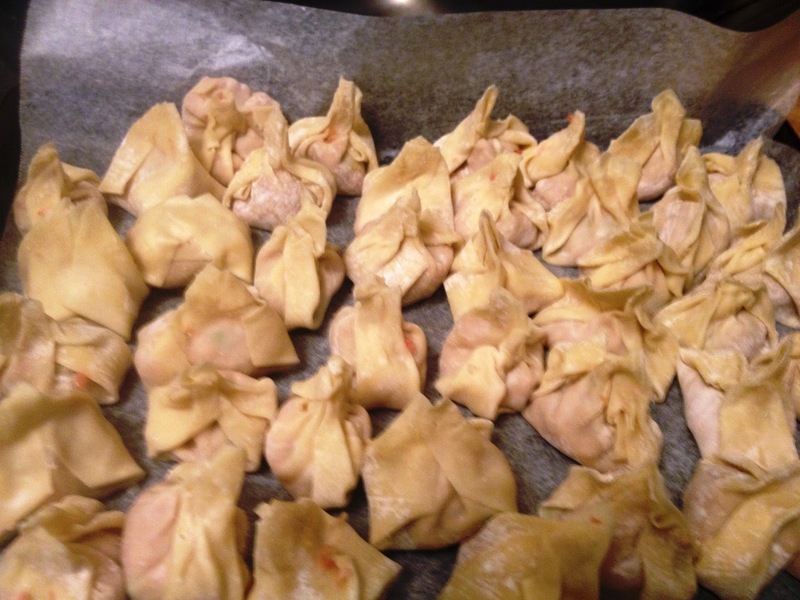 If you steam a wonton skin, it becomes soft, pliable and kind of gummy. So, they will stick to a pot in a heartbeat unless you know what you're doing. So what do you do? You fry the bottoms of your dumplings in a thin layer of oil until they are crispy. Then, carefully (very, very carefully) add water to the pan and cover it quickly to steam. The fried bottom keeps the dumpling from sticking to your pot. Skip this step and you have one stuck-to-the-pot fiasco. So, ever since Susannah taught me this technique, I've been making my own. They are ridiculously easy and so darn tasty. Tonight's batch started with about a pound of ground pork. 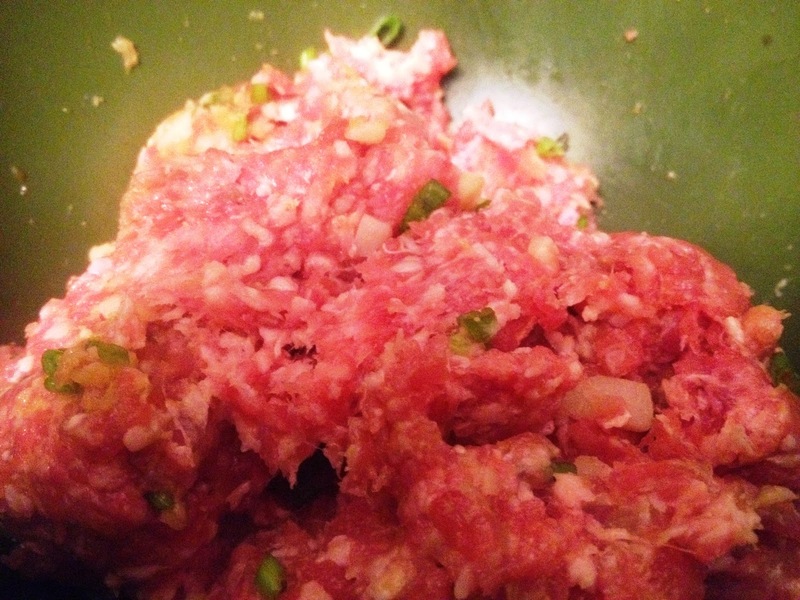 I grated ginger and garlic over the meat, added chopped green onion and chopped water chestnuts. Then I added just a little soy sauce for flavor and mixed it all up with my hands. Then, I placed about 2 teaspoons of meat into the center of my wonton wrapper, wet the edges with water and just twisted them up. Like I said, heat a thin layer of oil in a skillet with a good fitting lid. Fry the bottoms of the dumplings until they are browned and easily lift from the skillet. Next, add about 1/4 cup of water. I shield myself with the lid as I add the water to prevent spatter and then cover it quickly. Let steam a couple of minutes and that's all she wrote. 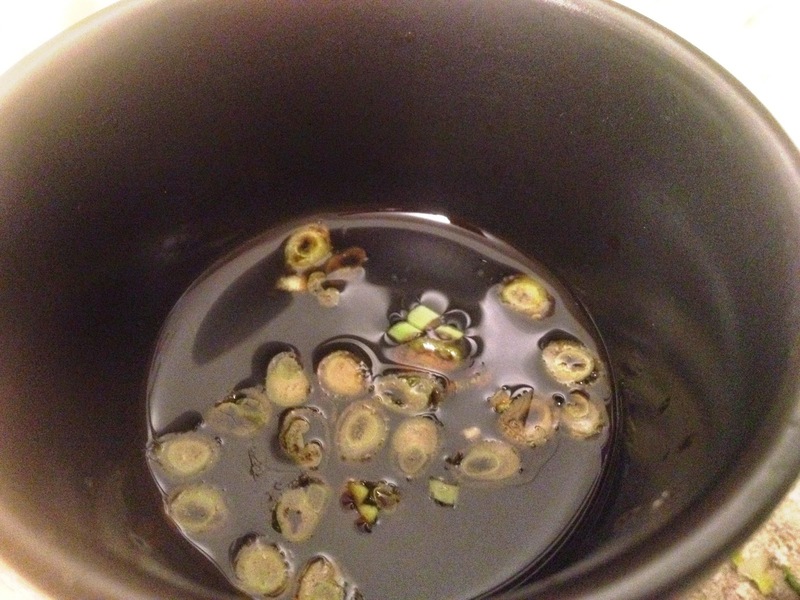 I like to mix up a dipping sauce of soy sauce, rice wine vinegar and some sliced green onion. Simple and delicious. 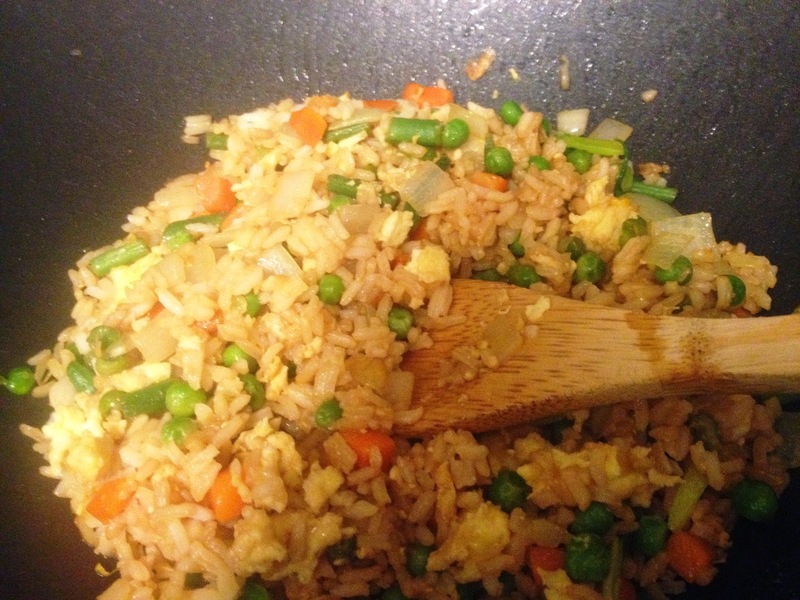 Tonight, I served the dumplings with a vegetable fried rice, using peas, carrots, green beans, onions and scrambled egg. This is a great way to spice up dinner at home and you can make big batches and freeze these little babies for another day. 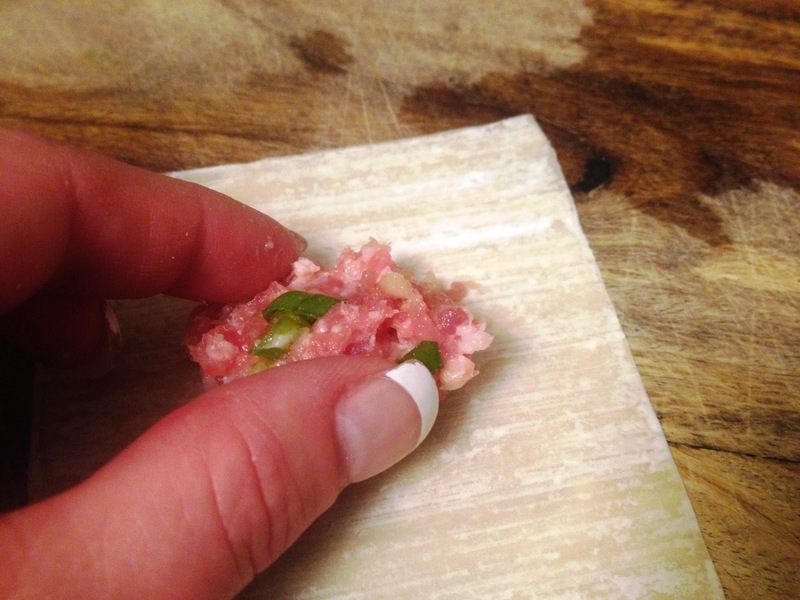 And, just like stir-fry or fried rice, you can make your dumpling filling with pretty much whatever you have available: ground pork, turkey, chicken. Ginger & garlic, green onion, carrot, bean sprouts, you name it. Don't let this simple dish not make its way into your home. So very easy and something interesting on the plate. Enjoy! Who doesn't love the movie "Julie & Julia?" If you're a cook, I think you have to love it. If you eat, you have to love it. Am I right? As a kid, I didn't watch much Julia Child. I remember just thinking that she was a frumpy, shrill-voiced old grandma type, which didn't interest me at all. However, my husband loved watching her so his impression is quite different. What this movie did for me was to educate me to what a truly unique, interesting and forward-thinking woman she was. After watching it yet again recently, I got to thinking about another cookbook of mine. I have referred to it before. 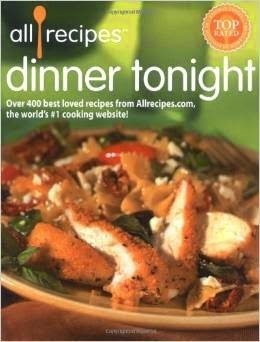 It's called Dinner Tonight and it was published in 2003 by the AllRecipes.com people. I was selling a house for a lady and went by one day to check in on her. She had begun packing her house up and in her dining room I found stacks and stacks of cookbooks up against the wall. When she said she was throwing them out, I said "Whoa, lady, back the truck up!" You could hear the squeal of the brakes in my head. Throw away a cookbook? What foul blasphemy is this? So I rescued this one and a few others from the stacks and couldn't be more happy about this fortuitous encounter. This cookbook is my super-#1-fandango-favorite. If you're unfamiliar with AllRecipes.com, go look it up now. Real, regular ol' people like you and me post their recipes on the site. Once one of the rest of us make it, we rate & review it. So back in 2003, the owners of the site decided to publish the highest rated recipes on their website. There you have it. What I love about this book is that it's a collection of their best. Every recipe I've tried has worked and has been really awesome. This is what lead me to decide that I will make any recipe in this book, even if it doesn't sound all that good at first glance. I learned this lesson with the "chicken breasts Pierre." One of my recents was "blackened shrimp Stroganoff." I went light on the blackening because of the little gourmand, but next time, I'm going to ramp up the spice. I loved this dish for a few reasons. First, so often when I think I'd like a hot, creamy pasta, this is what I see in my head. 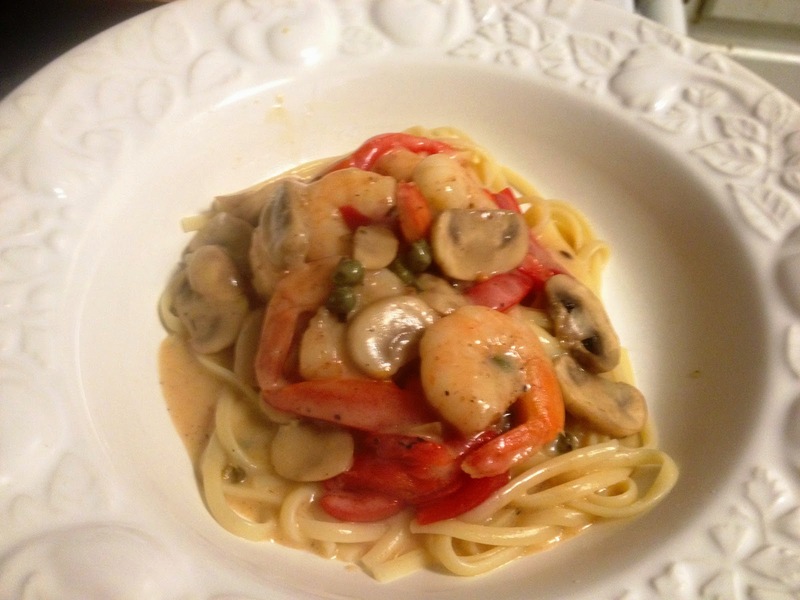 Delicious shrimp with tangy sour creaminess, capers, roasted red pepper all tangled up in some noodles. Add a hunk of crusty bread, maybe a little Caesar salad on the side and you have the perfect pasta supper. The blackening seasoning paired with the creamy Stroganoff sauce is a sublime marriage of flavors that probably would have never thought to put together. And, of course, you can never go wrong with shrimp!